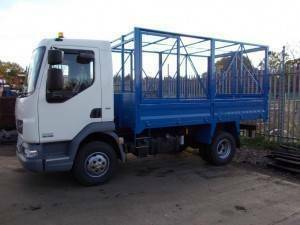 Cage tippers are one of many commercial vehicles available in the fleet from ND Brown. The special capability of cage tippers is that they can transport unusual shaped cargo which would be prone to fly away in transit. For example, many councils across the UK use this type of machine when transporting green waste from pruning and thinning branches, trees, and shrubs. Emptying litter bins is a regular task to keep our towns and cities clean. The sacks of detritus can be safely transported without the risk of the contents being blown away and causing a risk to other road users and pedestrians. Cage tippers help you comply with the laws related to keeping a secure vehicle load. With depots in Wolverhampton serving the Midlands, Northern England, and North Wales. Our Devon based depot serving South West England and South Wales. The Kent depot covers the South East and London. Our Scottish base is in Plean, near Falkirk, perfect for hiring out cage tippers to Glasgow, Edinburgh and beyond. Customers in Northern Ireland can contact our Belfast depot. The 7.5 tonne GVW tipper with a cage boasts a large enclosed metal cage with full length barn doors on the back. This is a very flexible vehicle with sliding side access doors and double drop sides. There is a reverse camera to aid the driver and safety equipment like a beacon bar and chapter 8 chevrons for increased visibility. These highly versatile vehicles are available for long and short term hire with a collection and delivery service for your convenience. View our online brochure to see all of our vehicles and their specifications. For further information about hiring cage tippers from ND Brown, please contact us via our online contact form or telephone 01902 791991. If you would like to buy a vehicle please see our vehicle sales section.